NOTE: Keep in mind, whilst reading this report, that I took this trip right in the middle of the 2010 political protests and Thailand was already suffering big tourism losses although the more serious incident in Mid may was still a couple of weeks away. 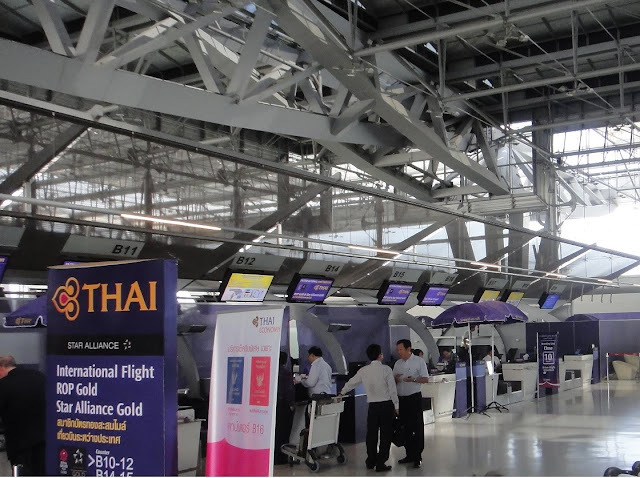 For this reason, it is much quieter around the airport in my pics and Thai Airways suffered big losses in passenger numbers during this time. My uncle, although he flies regularly on Thai Airways only manages to maintain Star Alliance silver status through Royal Orchid Plus, so he has never actually seen the inside of an airline lounge! Today will be his first time! For this reason we plan to arrive nice and early to enjoy the lounge facilities with my Star Gold access. We set off from central Bangkok in heavy traffic but about 15 mins into the trip my uncle realised he had left an item in the hotel, so we had to ask the taxi driver to turn back. After sitting in such heavy traffic we were both quite frustrated to say the least! Anyway, we finally got back to the hotel and underway again, making a quick stop at my apartment on the way to pick up my case for the short trip before heading off to Suvarnabhumi. The whole time the taxi driver muttering under his breath, I have to say I'm not too sure what he was saying but I don't think he was impressed with the diversion... even if he did get more money for it! First things first, its off to the Star Alliance Gold check-in rows at Bangkok Suvarnabhumi airport. To the lowly Silver card holder (my uncle), things were already looking up with a premium checkin zone. As you can see in the picture above there was no wait whatsoever! As always is the case for me with Thai Airways the system was not printing my BMI gold status automatically on the boarding pass, but the very experienced and efficient check-in agent managed to force the status to show and handed us our boarding passes. I had selected 38H and 38K, I assumed the middle seat would not be occupied, and I was told it was not. Lovely, 3 seats for the 2 of us! The friendly girls at the desk did not question why I was using the SQ lounge on a TG boarding pass, which is a good thing! They were very friendly and welcoming indeed, just asking to see my gold card and putting the number down on the guest list. It was still a little early for the Singapore Airlines passengers so the lounge was nice and quiet but the food was well stocked. 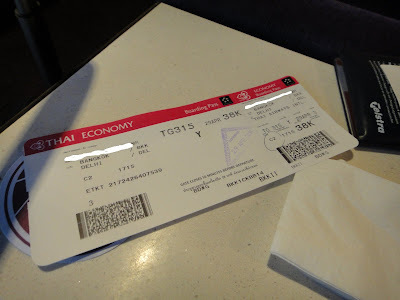 After a nice helping of dim sum, haagen dazs ice cream, and vodka and orange juice it was time to bid farewell to the SQ lounge and head for the Concourse C Thai Airways lounge. This next lounge was located a short stroll from gate C2, where our flight to Delhi was departing. As we strolled through the front doors to the lounge we saw a piece of paper stuck on the wall saying that TG315 to Delhi would be delayed 25 minutes, ETD would be now 18.20. No problem for us, more time for lounging and my Uncle was enjoying every minute! Gate C2 - but where is our plane! We arrived at gate C2 to find no plane connected to the jetway, I remembered that there was some works going on around this part of the tarmac... looks like it will be a bus to the aircraft today. bus features 50th anniversary stickers.. nice! After a lengthy but scenic taxi ride (if you like plane spotting like I do! ), we finally arrived beside HS-TKC, a Thai Airways Boeing 777-300 that was first delivered to Thai in October 1999. That makes this bird 10 and a half years old. We were warmly welcomed by the crew and directed across to the right side of the aircraft, by this time most of the other passengers were all seated. The passenger load looked to be well under 50%, even in the forward economy cabin. Our seats, colourful and very comfortable! According to the Thai Airways seat map documents, the forward cabin of the B777-300 has 34 inch seat pitch. This seemed pretty correct to me, I found there was even enough leg room for me to cross my legs. I am 178cm tall and found it all very spacious, particularly with the middle seat free to spread out. All quite ample for an early evening 4 hour trip to Delhi. I glanced out my window and noticed an unmarked Boeing 747-300. That aircraft belongs to Orient Thai and was recently acquired form Japan Airlines. At this point the captain came on the PA to inform us we would have a further delay as they were holding the aircraft for several passengers connecting from Manila. My uncle was slightly annoyed that it would end up being quite late before we arrived at the hotel in Delhi... I was still presenting a vodka smile so wasn't too concerned. With the lights of Bangkok glistening below we turned right and tracked west towards Myanmar and onward to India. It did not take long for the crew to arrive with the pre-dinner drinks trolley. I decided to switch to Beer at this point (not a wise move as I had a cracking headache when we landed in Delhi). I took a quick look down the back of the aircraft and noticed there was plenty of vacant seats, anybody could have gone and had a nice make-shift bed down the back if they felt like it. We were quite happy though in row 38 watching the inflight entertainment system. Just one circle around and we continued on towards the Indira Gandhi International Airport, making a smooth touchdown. We taxi'ed past the new terminal under construction and parked next to an Air India 777. Well, the flight was over but the adventure was only just beginning... I was in a new country, and knew I was in for a blasting of the senses as soon as we left the airport. I stepped off the plane fairly satisfied with the Thai Airways experience again, it was a typical Thai flight with decent service, the food could have been better, but perhaps it was appealing to the Indian passengers? There was a bit of a queue at immigration but nothing too bad, it wasn't long and we were out into the stinking hot night fending off touts and looking for a meter taxi, and when we found one I was shocked to see how old it was!! I was only in India a short time, but I would love to go back sometime and see more. Thanks for reading! great report, thanks so much for sharing! Finding cheap airfares, is a technique which will facilitate. i do not mind compromising on airlines, as it's very not an enormous a part of my vacations. it has always daily at the start, and daily at the tip. generally the journey is that the destination, however not perpetually.